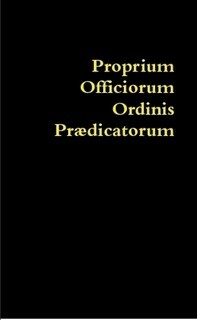 At the request of a number of Dominican friars of my Western Dominican Province, Dominican Liturgy Publications has produced a reprint of the Proprium Officiorum Ordinis Praedicatorum of 1982 (i.e. the Latin Dominican propers for the Liturgy of the Hours), which has been out of print for many years. A copy may be ordered here. I believe that this book will be of great use for not just Friars, nuns, and sisters, but also for members of the Dominican Laity who want to pray the Liturgy of the Hours in Latin with Dominican propers and other elements. Before ordering a copy, you should read the product description carefully so you understand the nature of his reprint. Apparently the original was never put under copyright, so it is public domain.